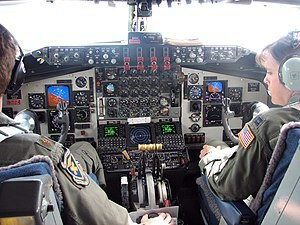 One of the big ambitious goals I have for some day is that I’d like to learn to fly a plane. With how much I’m traveling, I don’t have time for lessons right now though. (I miss enough of my horseback riding lessons as it is) I did take *one* lesson once when I found a coupon for it, and it was AMAZING and AWESOME and I cannot wait to do it again! But it’s really expensive and as previously stated, I couldn’t consistently take lessons currently. But, I also do travel A LOT. Which means I am on airplanes A LOT. I know that there’s this whole protocol of communication between the cockpit of the plane and the air traffic controllers on the ground. And lately, whenever I can during a flight, I like to listen in to that cockpit chatter. It’s not available on every flight, and it is up to the discretion of the pilot whether it gets turned on or not. I know that on United flights (the ones that don’t have DirecTV) you can tune into channel 9 and listen in as the cockpit communicates with the towers on the ground. It’s fun to know which way the plane is going to turn before it actually banks. I figure that also in the highly unlikely event of a crash, I’ll be well aware of what’s going on should the pilot be too busy trying to keep us in the air to tell us what’s going on. But mostly, I’m doing it to learn the jargon and protocols involved. The pilot must always sign off with the flight number (as opposed to “over” or “roger”). You change which channel you are listening to and communicating with as you fly across the country. When a pilot switches to a new channel, you must announce yourself to the new people who are helping you get to your destination. Sometimes, those on the ground will ask the incoming planes about whether or not they encountered much turbulence at the altitude they are flying at. Other times, the pilot will experience turbulence and request a different altitude to avoid it. The hardest at times to interpret is when the plane is taxiing before takeoff and after landing. Airport runways are labeled with letters and the person in the tower sometimes rattles off the directions to get to the actual takeoff runway so fast I don’t know how the pilots remember it! I know this isn’t going to put me in the pilot’s seat of my very own Lear jet any time soon, but I figure at least I’m doing something to move toward my goals. Start with the baby steps, and soon, you’re not just running, you’re flying! What little steps can *you* do today to bring you that much closer to your dreams? This entry was posted in Don't Ignore Your Dreams and tagged Flying, Goals. Bookmark the permalink.